For stuffing – Soak toor dal for about 30 minutes. Pressure cook for 3 whistles. Let it cool for sometime. Drain the water and mash the dal with a spoon. Take wheat flour in a bowl. Add oil and knead the dough. Keep it aside. Soak saffron in 1 tablespoon of milk/water. Take a pan, add 2 tablespoon of ghee and add mashed dal. Add sugar, cardamom powder, nutmeg powder and stir it till it thickens. Add saffron mix and cook it for about 2 minutes. Keep it aside. Let it cool. Make 20 balls. Make small balls from the dough. Take one ball and roll the roti of about 2 inch diameter. Put one dal ball and cover it with roti dough from all the sides. Make a ball again, flatten it slightly and roll the roti of about 4 inch diameter. Use wheat flour for rolling as per the need. 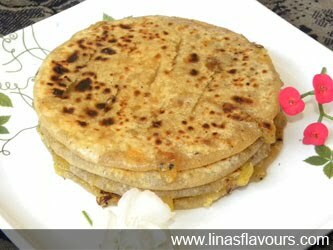 Heat tawa and cook puran poli on both the sides on a medium flame. Apply ghee. Prepare all the puran polis in the same way.